Ethical Approvals: In cases where animals are used in the submitted manuscript, the methods section must clearly indicate approval from the ethics committee of the institute or organisation and should state that all efforts were taken to minimize pain and discomfort to the animal while conducting these experiments. Ethics of Investigation: Authors should make sure that the manuscript is designed according to the guidelines of the Helsinki Declaration as revised in 1975, otherwise the manuscript will not be accepted for publication or will be rejected later. Blinded Review: ResearchersLinks believes in a fair and rigorous review process. Therefore, all submitted manuscripts will be reviewed by at least two experts in the appropriate field, determined by the Editor-in-Chief of each journal. The names of the reviewers will not be displayed on the manuscript and will not be disclosed to any authors. Appeal of Decision: Authors have the right to appeal the Editor's decision in writing to the Editorial Office stating the reasons for appealing the decision with evidence and supporting data. Permissions: In case any part (e.g. table or figure) of the submitted manuscript has been taken from previously published work, it is the responsibility of the authors to obtain permission either from the publishers or from the authors depending on the copyright ownership. ResearchersLinks can demand this permission anytime, pre- or post-publication of the study. Plagiarism Policy: The Editorial Office will strictly monitor text plagiarism and obvious fraudulent data prior to the review process and if plagiarism is detected at this stage or later, the manuscript will be rejected and will not be reconsidered in any journal published independently or in association with ResearchersLinks, Ltd, UK. After successful online submission of the manuscript, the author is required to deposit an amount of Rs.1000 as processing fee (non-refundable). After receiving the fee submission proof, manuscripts are transferred to Editors to initiate the review process. You may deposit the required processing fee Rs. ​10​00/- (non-refundable) via HBL online transfer or through any ATM to the Account given below. 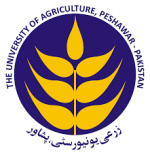 Note: A scanned copy of Processing Fee payment​/slip must be sent via email to (supdtsja@aup.edu.pk) and write manuscript ID and the title in the subject line. After completion of review process, if the article is accepted for publication information will be passed on to the first/corresponding author. After payment of publication/printing charges as shown in the table below and bank details above, articles are processed for publication. 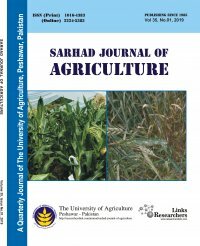 Only electronic files in Word format (.doc, docx) can be submitted to the Sarhad Journal of Agriculture. Submission shall only be made by one of the authors, main or co-author, who should take the responsibility for all correspondence throughout the submission and review process. • The manuscript is not being considered elsewhere for publication. • All authors have approved the publication of this manuscript. • The relevant institution has approved the submission, if required. • The authors permit editing of the paper for readability. Research Article: An article containing full detail of findings. It should consist of Title Page, Abstract, Introduction, Material and Methods, Results, Discussion (Results and Discussion can be combined), Acknowledgements, Authors's Contributions, References, Tables, and finally Figure Legends. Short Communication: A shorter version of manuscript. Short Communications may be published more rapidly. It should consist of Title Page, Abstract, Introduction, Material and Methods, Results, Discussion (or Results and Discussion), Acknowledgements, Author's Contributions, References, Tables, and finally Figure Legends. Mini-review: These should focus on an emerging topic in the field. Prior permission from the Editor-in-Chief is mandatory. There is no specific format of different sections. Review: Should comprehensively focus on an emerging topic, which fit into the scope of the journal. Prior permission from the Editor-in-Chief is mandatory. There is no specific format of different sections. Commentary: An expert discussion on controversial results or to connect different studies published separately. Editorial: An opinion of the Editor-in-Chief or Associate Editors. The manuscript should contain an abstract. Abstracts shall not contain any references and should clearly and accurately summarize the main focus of the study. The word count should be under 250 words. This section should summerise existing literature sufficiently so that the readers understand the background of the findings. At the end, the introduction should contain the objectives of the study. Authors are encouraged to use headings, however, these are not compulsory. This part should contain sufficient experimental and analytical details so that any readers can repeat the procedures without consulting the author of the study. To have better understanding of the methodologies, it is recommended that this section is divided under headings. This section may be divided by subheadings or may be combined depending upon the nature of manuscript and the type of study. This section should clearly explain the main conclusions of the work. It should not be more than one paragraph and should not repeat the text presented earlier in the text. Efforts should be made to highlight the importance and relevance of the study. All acknowledgments (if any) should be included in the manuscript before the Reference section and may include supporting grants etc. Novelty Statement is required for submission of every article. This statement should provide information in one or two sentences as to what is new and novel in the manuscript in relation to prior related work, including the authors' own. It is important that each author of the manuscript should be properly credited for the ​contribution he/she has ​made in the ​experiment. The author is required to pro​vide a certificate from concerned Supervisor/Advisor about author’s contribution ​​in order to ensure transparency and fairness in the publication as per HEC rules​ or other wise​. ​Moreover, all authors shall certify that they have read the paper before submission.​ These classification and specification of contributions are also helpful for policy makers and funding agencies. Therefore, Smith and Franklin Academic Publishing Corporation, UK, encourages specifying the contribution of each authors in the submitted manuscripts before the References Section. 4. Agreement to be accountable for all aspects of the work in ensuring that questions related to the accuracy or integrity of any part of the work are appropriately investigated and resolved. 1. Please use the initiates of the authors (e.g. JFV for Jean Francois Valarcher). 2. Followed by the nature of work (e.g. designed the experimentation, performed animal experiments, drafted manuscript). 3. Finally include a statement of “All authors read and approved the final manuscript”. Example: MM, ABV performed the immunological assays; AJV and JKA wrote the first draft of the manuscripts. MZS designed the experimentation and SB analysed the data. All authors read and approved the final manuscript. Please note that all those authors who may not fall into the criteria of “authorship” shall only be mentioned in the “Acknowledgements Section”. In cases where no conflicts of interests exist, authors should state that “The author(s) declare(s) that there is no conflict of interests regarding the publication of this article”. Otherwise, they should mention any conflict of interest in this section of the manuscript. References in the text should be mentioned as Smith, 2005 (when there is single author) or Smith and Franklin, 2005 (when there are two authors) or Smith et al., 2005 (when there are more than two authors). Munir, M. 2002. Mononegaviruses of veterinary importance. Volume I: Pathobiology and molecular diagnosis: 1st edn. CABI, UK. Narwal, S.S. 2004. Allelopathy in crop production.Scientific Publishers, Jodhapur, India. Gnanadurai, C. W. Lyon, D. C. Jackson, A. C. Fu, Z. F. 2014. Rabies Virus. p. 209-221. In: Munir, M (eds), Mononegaviruses of veterinary importance. Volume I: Pathobiology and molecular diagnosis, 2ndedn. CABI, UK. Tanner, J.W. and D.J. Hume. 1978. Soybean management and production. Chapter.6. p.157-217. In: A.G. Norman Soybean Physiology, Agronomy and Utilization Academic Press. New York. Author, A. 2003. Thesis title with lower case initials to all words. PhD thesis, University, Town, Country. Pakistan Tea Assoc. 2010-11. Import statistics. Business Plaza Mumtaz Hussain Road, Karachi, Pakistan (www.pakistanteaassociation.com). Statistix. 2006. Statistix 8 user guide, version 1.0. Analytical Software, PO Box 12185, Tallahassee FL 32317 USA. Copyright © 2006 by Analytical Software. Figures should be submitted in separate files and should be uploaded to the online submission system (eSubmit) along with the manuscript. All figures should be cited in the paper in consecutive order. Figures should be supplied in .jpg or jpeg formats. Tables should be submitted in separate files and should be uploaded to the online submission system (eSubmit) along with the manuscript. Tables should be cited consecutively in the text and should not be abbreviated. The formatted galley proof will be sent to corresponding authors only and should be returned within 2-3 days of receipt. It is the responsibility of the corresponding authors to consult the other authors for corrections and proof reading. Open Access authors retain the copyrights of their papers, and all open access articles are distributed under the terms of the Creative Commons Attribution License, which permits unrestricted use, distribution and reproduction in any medium, provided that the original work is properly cited. Please consult the bottom of each page of the ResearchersLinks website for detail.